This reliquary was made to contain a thorn, supposedly from the Crown of Thorns that was placed on Christ’s head before the Crucifixion. The armorial enamelled plaques in the base show that it was made for Jean, duc de Berry (1340–1416). The Crown of Thorns itself was a French royal relic, housed in its own chapel in Paris. Individual thorns were detached to make precious reliquary jewels. Reliquary of gold, richly enamelled and set with rubies, pearls and sapphires. Architectural base in form of castellated fortress with a half-length angel sounding a trumpet occupying each turret, base also with arms of Jean, duc de Berry in rectangular panels of blue and red translucent enamel. The front is a depiction of the Resurrection of the Dead, a green-enamelled mound rising from the base from which coffins protrude, the dead rising from within. Above is a rock-crystal window, the Thorn placed vertically in the centre, mounted on a cabochon sapphire, above an inscribed scroll. Figures of the Virgin and St. John kneel beside the Thorn, Christ with his five wounds is seated behind it, his feet resting on a white-enamelled globe. Two angels hold a crown of thorns above his head, the instruments of the Passion in their other hands. An arch is formed around the whole by the twelve Apostles within a mass of leaves and branches, God the Father at the top. On the reverse are two hinged doors decorated in relief and pontillé with the figures of St. Michael and the Devil and St. Christopher carrying the Christ Child, inside these is an empty cavity covered in modern glass, probably a space for another relic. Above this is a roundel with the face of Christ in relief amidst sunrays. Marked. This object was previously owned by Treasury of Charles V and Jean de Berry, collected by Anselm von Rothschild and bequeathed to the British Museum by Ferdinand Anselm Rothschild. Provenance: Jean, duc de Berry (d.1416); the Treasury of the Emperor Charles V (reigned 1519-55) and subsequently in the Imperial Hapsburg Collection in Vienna (first surviving Austrian record appears in an Inventory of 1544); lent to an exhibition of Medieval and Renaissance Works of Art, held in Vienna under the auspices of the Vienna Alterthums-Verein in 1860; entered the collection of Baron Anselm von Rothschild (d. 1874) between 1872 and 1874 (cat. no. 607); by inheritance to his son Baron Ferdinand Rothschild (d. 1898). Commentary: When this great masterpiece reached the British Museum in 1899, its true identity had been completely lost. In Read 1902 it was described as “Spanish, late 16th century” and, because none of its former history was known to Read, there was no reference to the very similar object in the Imperial collections in Vienna. Twenty-five years later the researches of Joseph Destrée were published and, for the first time, it was recognised that there were two almost identical reliquaries and that the one preserved in the Geistliche Schatzkammer of the Hofburg, Vienna (the Ecclesiastical Treasury of the Imperial Hapsburg Court in Vienna), was a modern copy and that the original was in London - in the Waddesdon Bequest at the British Museum. Significantly, Joseph Destrée punctiliously acknowledged his debt to Professor H.J. Hermann in reaching this conclusion, and, moreover, there exists an earlier letter from Professor Hermann, dated 23 November 1923, which expresses the view that the Vienna version seems to be a forgery of about 1880. In those intervening twenty-five years several official Austrian publications had appeared, illustrating and discussing the version in the Geistliche Schatzkammer; from these publications it becomes clear that it still had not been realised in Austria that the item preserved in Vienna was only a modern copy. Indeed, the 1901 ‘Mittheilungen der K. K. Central Commission für Erforschung und Erhaltung der Kunst und Historischen Denkmale’ had misleadingly included two woodcuts illustrating the original - not the modern copy that was actually there in Vienna; presumably this error was unintentional and arose because these woodblocks had been made from old photographs of the original, taken before the modern substitute version had been made. The 1909 official ‘Guide’ to the Geistliche Schatzkammer and the revised second edition by Dr Dreger make no reference to the existence of the British Museum's version, though Dr Dreger cautiously avoided a precise indication of date, preferring the phrase “in der art der späteren Gothik” (“in the later Gothic manner”) to describe the object in the Schatzkammer. The compiler of this 1758 Inventory was careless and did not notice that the gemstone at the top of the joyau is a cabochon sapphire. There are, today, fourteen rubies and two sapphires on the Reliquary. Similarly, there are fourteen pearls - not the twelve recorded by the compiler of the 1758 Inventory. Perhaps two pearls had already been lost by 1758, and certainly there are now two pearls (one in the 'glory' behind God the Father, the other below St John the Baptist) which seem to have neither their original gold 'cradle' setting nor even the same quality of lustre. Alfred Darcel in 1863 described the location of this 1860 Exhibition in Vienna (in his publication ‘Les Arts Industries du Moyen Age en Allemagne: rapport addressé à son excellence le Ministre de l'instruction publique et des cultes, sur l'exposition archéologique de Vienne en 1860’). He stated that it was organised and mounted by the Archaeological Society of Vienna in a newly built complex that included La Bourse at one end; he went on to speak of “un passage la traverse à l'une de ses extrémités et c'est une des salles inoccupées, au second étage, que la Société des Antiquaires avait heureusement choisie pour étaler les richesses qui lui avait été confiées”. In his survey Darcel did not mention the Holy Thorn Reliquary, perhaps because he did not recognise it as a medieval object and was content to follow the 1860 ‘Katalog’ entry which had described it as '16th century'. Two important facts about this Reliquary of the Holy Thorn have, therefore, been established by the entries in the Inventories (1677-1856) and by the 1860 ‘Katalog’ entry: firstly, neither the date nor the place of its manufacture was correctly understood and, secondly, the identity of its first owner had been so completely lost that the significance of the two heraldic enamelled plaques was not appreciated nor in any way recorded. When the two plaques were first recorded (in Schestag 1873/4, no. 607, with the date 'um 1500', and again in Read 1902), they were briefly described, but there was no suggestion that they had any heraldic significance nor, indeed, was there any kind of comment. In Dalton 1927 the two enamelled plaques were not even mentioned in the description of the object, although Destrée (1907) and Falke (1908) had used them as evidence for their argument that the Reliquary had a French origin. 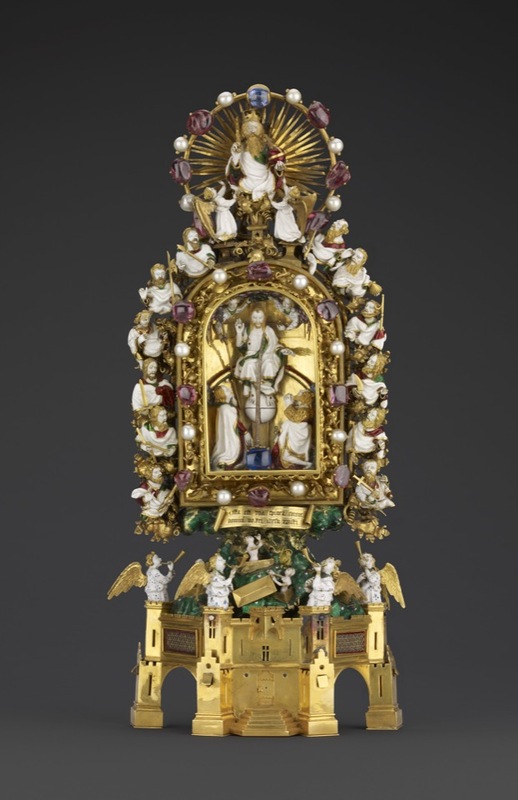 Following upon the 1860 Exhibition, the Holy Thorn Reliquary was returned to the Geistliche Schatzkammer, which at that time was under the control of the Vienna Hofburgpfarramt (Court Parochial Office); this body had the responsibility of appointing a custodian of the collection, who was usually a priest. Whether the Holy Thorn Reliquary had been damaged at the Exhibition in 1860 or whether there was a general new policy for improving the appearance of the treasures seems uncertain, but undoubtedly the Holy Thorn Reliquary and at least four other early items from the Geistliche Schatzkammer were sent in the 1860s to the workshop of Salomon Weininger (1822-79) for restoration, and in each of these five cases a substitute copy was made to take the place of the original; the substitutes were all accepted as the genuine originals and were, of course, placed on display with the rest of the Geistliche Schatzkammer. Only one of the five became the subject of an enquiry shortly after Weininger's death; it was the famous large Fatimid rock-crystal ring, mounted in a Gothic monstrance, purchased by the Germanisches Nationalmuseum, Nuremberg, in 1887. When the offer of sale was first made, the Nuremberg Museum authorities immediately recognised this spectacular object and notified the Vienna Court Obersthofmeister, but the Austrian response was to refuse that unique opportunity to buy it back. Their decision is perhaps more understandable than their unwillingness at the time to seek to regain possession of it through the law courts. The original is still in Nuremberg and the fake is still in Vienna. By 1887 the criminal activities of Salomon Weininger were already a thing of the past because his substitution of faked copies in place of the four genuine Renaissance bronzes he had been given to clean and restore from the Estensische Kunstsammlung in Vienna - two of the originals are in the Victoria and Albert Museum (Salting Bequest) - had led to his exposure, and in June 1876 he had been sentenced to five years' imprisonment. Indeed, he had died in the Austrian State Prison at Stein three years later (see L. Planiscig, ‘Die Estensische Kunstsammlung’, Vienna, 1919, nos 207-8; ‘idem, Andrea Riccio’, Vienna, 1927, p. 252; and H. Weihrauch, ‘Europaische Bronzestatuetten’, Munich, 1967, p. 490). Apart from the Fatimid rock-crystal and silver-gilt fake, revealed in 1887 by the Nuremberg Museum authorities, the four other Weininger substitutes remained undetected in the Geistliche Schatzkammer for more than half a century. However, any lingering doubts that may have remained after 1927 concerning the relationship between the Waddesdon Bequest Reliquary and the Weininger substitute in Vienna were finally dispelled in September 1944, when the modern copy was brought by members of the staff of the Kunsthistorisches Museum, Vienna, to the British Museum and compared with the original; members of the Department of Metalwork at the Victoria and Albert Museum were invited to attend this conclusive examination. Three years earlier an article by Dame Joan Evans in ‘The Burlington Magazine’ (1941) had sought to establish the heraldic significance of the two enamelled plaques set in the fortified walls of the gold base of the Reliquary. On the basis of misinformation from Mr Van der Put about the armorial bearings the article set out to relate this Reliquary with an item once owned by Louis, duc d'Orleans (1372-1407), the younger son of the French king, Charles V, and described in the Inventory of 1408, which was made at Blois after Louis' death (see F. M. Graves, ‘Deux Inventaires de la Maison d'Orléans’, Paris, 1926, p. 101, no. 366: “Ung tableau à mettre reliques de la mémoire de la Passion Notre Seigneur où sont esmaillez les XII Apostres, et dedans sont huit grosses perles, trois balaiz et trois saphirs”). Despite the obvious discrepancies, Joan Evans took the view that they were small and “cannot be allowed to invalidate the identification”, and, in her view, the Reliquary was made for the duc d'Orleans between 1388 and 1407. This identification was repeated, even more positively, in 1948 in her major book ‘Art in Medieval France’ (p. 207, fig. 197) and was accepted without demur by no less an authority than Erwin Panofsky in 1951. However, by 1954 Theodor Müller and Erich Steingräber had compiled their 'Katalog' of French gold enamelled sculpture c. 1400 and decided that, because of the discrepancies, they could not accept this identification of the Reliquary with the Orleans Inventory of 1408 (no. 366), though they did proceed to establish most convincingly that the stylistic attribution to a Paris workshop c.1400 was correct (pp. 66-7). Curiously, they omitted to include in their description of the Reliquary any mention of the two heraldic plaques; furthermore, they incorrectly stated that in addition to the gold enamelled parts the Reliquary also comprised silver-gilt 'framing parts' (“rahmende Teile Silber vergoldet”). Consequently, in the mid-1950s the two enamelled heraldic plaques still remained the major aspect of the Reliquary to be tackled. Having observed precisely the same coat of arms recurring in several of the famous illuminated manuscripts that were originally in the collection of Jean, duc de Berry, the author decided to consult the President of the Société Française d'Héraldique et de Sigillographie, who at that time was baron Meurgey de Tupigny, and, in a written reply, was told that these were, indeed, the arms of a prince of the House of Berry and should be read as follows: “d'azure semé de fleurs-de-lis d'or à la bordure engrêlée de gueules” (see Tait 1962, p. 226, fn. 2); this information was communicated to Peter Lasko and published in the same year (see Lasko 1962, p. 262, fn. 7), where it was pointed out that “unfortunately, none of the inventories of the Duc de Berry's possessions, made in 1401, 1413 and in the year of his death in 1416 describes any piece identifiable as the Thorn Reliquary as we see it today, although a large number of objects are listed that were decorated with the arms of Berry”. Jean, duc de Berry (b. 1340-d. 1416), was the brother of the King of France, Charles V (reigned 1364-80), and uncle of Charles VI (reigned 1380-1422) and is well-known as a grand patron of the arts and an avid collector, whose impatience often led to the design of his commissions being altered before they were half-finished. Consequently, the total lack of an appropriate description in those three Inventories of the Berry collections does not necessarily have much significance, and in addition the scale of his princely gifts, especially of joyaux, was only equalled by his brothers and nephews, the Dukes of Burgundy and Anjou (see Meiss 1967, pp. 48-50). Although it is clear from the records that these royal dukes employed goldsmiths on the most lavish scale in the fifty years from 1360 to 1410, very few of their fine commissions have survived - indeed, many pieces were melted down within a few years of their completion. According to the ‘Commentarii’ of Lorenzo Ghiberti, of Florence, one of the finest goldsmiths was the Cologne master named Gusmin, but he was so bitter to find his major creations for his princely patrons north of the Alps being put into the melting-pot that he retired to a monastery and ceased to be a goldsmith. Before examining the duc de Berry's Inventories in search of this Reliquary, it may be noted that the difficulties of the terminology have been much discussed (for a neatly summarised account see Panofsky 1951, p. 76). Apparently, in the later Middle Ages a bona fide reliquary could be listed as a ‘jocale’ or ‘joyau’ and, conversely, many a piece of jewellery might be referred to as a ‘reliquière’ or ‘reliquaire’ (see Erich Meyer, Reliquie und Reliquiar im Mittelalter, ‘Festschrift für Georg Heise zum 28 June, 1950’, Berlin, 1950, pp. 55 ff., and also J. Braun, ‘Die Reliquiare des christlichen Kultes und ihre Entwicklung’, Freiburg, 1940, pp. 70 ff., 286 ff., figs 269-88). Turning now to an interpretation of the written evidence contained in the Inventories of the duc de Berry's collections, it is important to note how vast and difficult a task faced the compilers and how much the individual qualities of these men affected the value and usefulness of the descriptions. The earliest is the Inventory of 1401-3 (Bib. nat. fr. 11496; pub. J. Guiffrey, ‘Inventaires de Jean, duc de Berry (1401-14.16)’, 2 vols, Paris, 1894-6. N.B. The only Berry Inventory that Guiffrey published in full, however, is the Inventory of 1413-16 (Archives nationales K.K. 258). The first Inventory contains 1,317 items and was the work of two different men; begun by Guillaume de Ruilly, ‘garde de joyaux’, on 2 December 1401, the task commenced in the Château de Dourdan (near Paris) and continued in the duc de Berry's principal residence, the Hôtel de Nesle in Paris. In May 1402 Ruilly was replaced by Robinet d'Etampes, who finished the Inventory by listing the items in the Château de Mehun-sur-Yèvre, in the Great Tower of the ducal Palace at Bourges and in the Chancellery of the Cathedral of Bourges. This Inventory was finished on 23 February 1403, but it also contains numerous notes dating from 1404 to 1407 recording the gifts made by Berry to the Sainte-Chapelle of the Palace of Bourges. Fortunately, Robinet was an exceptionally thorough and precise keeper of the ducal collections and remained with Jean de Berry, even being present when Jean signed his will in May 1416, shortly before his death. The fullness of Robinet's descriptions and his practice of updating the lists with notes about new acquisitions, gifts and alterations give the Berry Inventories unrivalled value. “10. Item, une coronne d'or en manière d'une coronne d'Empereur, où il a quartre florons, et en chascun floron une espine de la coronne de Nostre Seigneur, garnie de perrerie, c'est assavoir: de douze gros balaiz et huit petis, dix-sept gros saphirs, huit petites esmeraudes, trente-six grosses perles et quarente autres perles moiennes; pesant tout ensemble quatourze mars et deux onces. Robinet's helpful annotation records the fate of the duc de Berry's richly bejewelled gold 'Imperial' crown containing the four Thorns from Our Lord's Crown of Thorns. It was broken up on the orders of the duc de Berry and the gold was delivered to his treasurer and the gemstones to Berry himself, who later gave eight emeralds to his Sainte-Chapelle at Bourges. Apart from six rubies, the remainder of the gemstones together with four other pearls were handed over to the goldsmith, named Renequino de Hallen, to convert into a jocali (“pro convertendo in uno jocali”). Nothing is known about this jocali, neither its design nor its subsequent fate. Today no single object survives that can be associated with the goldsmith named Renequino de Hallen. Consequently, he is just a name in an inventory and, tempting though it may be, there are no grounds whatsoever for asserting that he was the goldsmith who created the duc de Berry's Reliquary that is now in the Waddesdon Bequest at the British Museum. Of the four Thorns three were given to the Sainte-Chapelle of the Palace of Bourges, while the fourth Thorn was set “in uno magno jocali auri” (“in a large gold jewel or reliquary”). There is every reason to accept that this last-mentioned jocali could be a reference to the Holy Thorn Reliquary, now in the Waddesdon Bequest at the British Museum, because not only has this Reliquary already been independently dated ‘c. 1400’ on purely stylistic grounds, but the phrase “uno magno jocali auri” would have been a wholly appropriate choice of words for Robinet to have used when describing this object. Furthermore, the fact that Jean de Berry had decided not to donate all four Thorns to his mortuary chapel suggests that he wanted to keep one relic for his own use and hence would have had his coat of arms incorporated into the design as he had done on so many of the precious objects in his collection. The gift of the other three Thorns to his new foundation, the Sainte-Chapelle adjoining his palace at Bourges, is most understandable because the latter was to stand comparison with the famous Sainte-Chapelle in Paris, which Louis IX (St Louis) had created in the 1240’s to house the Crown of Thorns and the large section of the True Cross, both of which had been acquired by the King from Constantinople where they had been kept in the chapel of the Byzantine Emperor's palace. Consecrated on 25 April 1248, the Sainte-Chapelle in Paris had been built as part of the King's palace on the Île-de-la-Cité, and Jean de Berry's project was intended to copy it but on a larger scale. Finished in 1405, it was to be his great mortuary chapel - as splendid as the one his brother, the Duke of Burgundy, had created at Champmol in 1388. Consequently, it was richly endowed with his wonderful library, with a large section of his costly treasures and several outstanding relics of Christ, including the fragments of Nails from the Cross given him by Pope Clement VII in 1384 and, most importantly, the piece of the True Cross itself, given him in 1372 by his brother, Charles V, who had himself cut it from Louis IX's precious acquisition from Constantinople - the pride of the Sainte-Chapelle in Paris. If that relic of the True Cross was getting smaller because of these royal incisions, so too the Crown of Thorns must have been losing many of its Thorns - indeed, Jean de Berry alone had at least six Thorns, one of which Robinet records was subsequently given to the King of the Romans (see item 272 of the 1401-3 Inventory and its annotation, discussed by Lasko 1962, p. 263) and another to the Duke of York (see item 62 of the 1413-16 Inventory, published in Guiffrey 1896; “ung cristal creux, longuet et roont, garni d'or, ou quel a une des espines de la saincte coronne Nostre Seigneur, lesquels cristal et espine sont d'un grant joyau d'or fait de maconnerie en manière d'ung tabernacle”.) The Crown of Thorns and the dispersal of the various Thorns in individual reliquaries are discussed in J. E. A. Gosselin, ‘Notice historique sur la sainte Couronne d'espines’, Paris, 1828, and by Fernand de Mély, Reliques de Constantinople in the ‘Revue de I'Art Chrétien’, 1899-1900, and in P. E. D. Riant, ‘Exuviae Sacrae Constantinopolitanae’, vol. III, Geneva, 1904. Significantly, the description mentions two sapphires (both have survived), thirteen rubies (now fourteen, all of which seem to be original) and fifteen pearls (now only fourteen, two of which may be replacements); however, there is no obvious place where the extra ruby could have been set in place of the missing pearl, since the gemstones and pearls alternate and are arranged symmetrically to create a carefully balanced effect. It would seem, therefore, that the compiler of the 1544 Inventory had made a mistake and, although the combined total number of gemstones and pearls was correct, he had recorded one too many pearls and one too few rubies. His listing of the two sapphires, on the other hand, helps to confirm the error of the 1758 Inventory where only one sapphire is mentioned but where one too many rubies is said to decorate the Reliquary. In attempting to pinpoint more reliably the date when the Holy Thorn Reliquary was made, two possibilities must be considered: either it was both made and given away before the compilation of the first Berry Inventory (December 1401 - February 1403), or it was made around 1405, when the duc de Berry's Sainte-Chapelle in Bourges was completed. In the case of the latter alternative there would have been a pressing need - widely recognised in medieval France - to provide the Bourges Sainte-Chapelle with an adequate endowment of well-authenticated relics. The duc de Berry's gift of three of the four Thorns would undoubtedly have helped most handsomely and, of course, his decision to have the fourth Thorn mounted in “uno magno jocali auri” without delay would have been equally in character. During the following five or six years before the second Inventory was begun, the Reliquary could have adorned the duc's collection until he chose to make a present of it. Of these two possibilities the first is less restricted in date but the second seems perhaps more likely on the arguments of stylistic comparison and development. (iii) The Calvary of Esztergom (before 1403), given by Marguerite de Flandre (1350-1405) to her husband, Philippe le Hardi, Duke of Burgundy, as a New Year's gift in 1403 and recorded in the Inventory of 1404, made immediately following the death of Philippe le Hardi (see E. Dehaisnes, ‘Documents et Extraits divers concernant l’histoire de l'art dans la Flandre, l'Artois et le Hainaut avant le XV siècle, part 11, 1374 -1401’, Lille, 1886, p. 827; full publication by Kovačs 1975, pp. 25-8, figs 1-7). (iv) The Goldenes Rössel (before 1404), given by the Queen of France, Isabeau of Bavaria, to her husband, Charles VI, as a New Year's gift in 1404. In July 1405 Charles VI pawned it to his brother-in-law, Ludwig of Bavaria (d. 1447); his heirs presented it in 1509 to the pilgrimage church of Altötting, near Munich, where it is still preserved (see full publication in Müller and Steingräber 1954, pp. 69-71).